A Helicopter Company, Supplier or Service Could Advertise In A Newspaper, Restaurant Magazine Or On The Radio, But Would That Help New Customers Find Your Helicopter Business? (San Diego, California, USA): Let's start with the premise that you are the owner of a helicopter operator company, a helicopter parts company, a helicopter services company or a helicopter manufacturer. There are many places where you could advertise, such as a local newspaper, a restaurant magazine or on the radio. But are these the most effective type of places to spend money on advertising? Let's say you are a helicopter operator and you decide to place an ad in the local newspaper for construction jobs. This might not be a bad idea. However, you are limited to the circulation of that newspaper, and you are advertising to one, possibly small, metropolitan area. Meanwhile, you actually want your advertising to reach multiple cities, states and/or provinces. If you place advertising in 10 to 20 newspapers, the cost for this could become extremely expensive. How effective would it be if a helicopter operator would advertise in a helicopter industry magazine? I'm not sure but am guessing that most contractors, big corporations, pipeline companies, local, state and federal governments, and utility companies don't subscribe to helicopter industry magazines. What about the company that sells helicopter parts, rotorblades, repairs helicopters, repairs helicopter engines, paints helicopters, outfits interiors (called completions) for helicopters and many other things of this nature? Would advertising in a local newspaper connect you to most of your potential customers? Most likely not. Advertising parts and services companies in a helicopter industry magazine makes more sense because more people who own helicopter companies probably subscribe to these magazines. But there's a catch. Typically, helicopter magazines have a customer base located in a regional area. In addition, advertising in a magazine is a shot gun approach. When people read helicopter magazines, they are there for the articles. My guess is they are not thinking that they need to scan the advertising to find that new supplier or services. (I have never picked up a magazine and thought, "I'm just going to look at the advertising today!) While some people might glance over at an advertisement, only a few people will be thinking, "Oh... I need to buy this product from this company!" Magazines have high readership numbers because people are reading... wait for it... the articles! And if a buyer needs to find a new supplier, what's the chance that the buyer will patiently flip through several industry magazines trying to find advertising for exact product they are looking for? 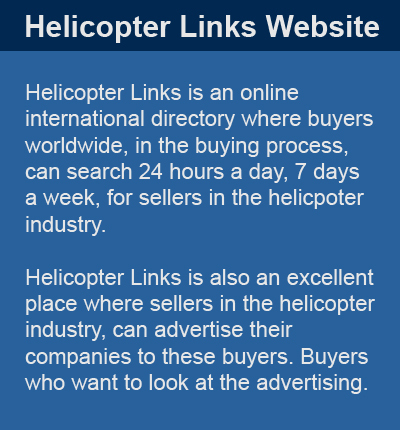 Many buyers will, most likely, go online to search for a helicopter supplier or service company. 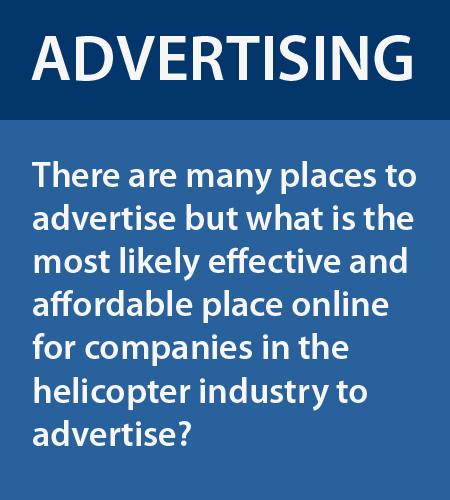 So why is advertising on Helicopter Links beneficial to most companies in the helicopter industry? Because about 80% of our visitors are buyers searching for sellers. We know this through our web statistics. About 80% of our visitors are people typing in two (2) or more searching terms in a search engine, trying to located a seller in the helicopter industry. Our visitors then find Helicopter Links and then search and use Helicopter Links to find suppliers or services in the helicopter industry. Directories of all types (from the printed yellow pages, to company directories, to Helicopter Links website) have a much lower visitor rate (or usage rate) than magazines but this is because people using directories are buyers who are in the buying process and they only want to look at the advertising. Our visitors are not here to read helicopter industry articles. Our visitors are on a mission, to find a seller in the helicopter industry. When buyers in the buying process find Helicopter Links website, they either use our website on their own, email us or they call us for a referral. We talk to people every month, from around the world, looking for helicopter operators, wanting to purchase a helicopter, looking for helicopter parts, helicopter repair service and more. The interesting aspect of Helicopter Link is that our visitors are from both inside and outside the helicopter industry. Visitors from inside the helicopter industry: Google Analytics (sometimes called the gold standard of webs statistics) tells us we have many of the major helicopter parts and engine suppliers such as BAE Systems, B/E Aerospace, Cobham, Goodrich, General Electric, General Dynamics, L-3 Communications, Raytheon Company, Rolls-Royce, Pratt and Whitney, Safran, Thales, etc.) visiting us, all the major helicopter manufactures visit our website, banks, private individuals, many different branches from different governments around the world visit us (city, state and federal and the military) and oil companies (probably searching to purchase helicopters or find parts and services, for their helicopters) visit our website. Visitors from outside the helicopter industry: We have general contractors, pipeline companies, utility companies, demolition companies and other companies from outside the helicopter industry, calling us multiple times each year trying to locate the right helicopter operator for their jobs. If you want to advertise to buyers inside or outside the helicopter industry, we can help you do this. If you want to advertise to people who want to look at your advertising, our website About 80% of our visitors are buyers in the buying process; therefore, people visiting Helicopter Links want to look at the advertising on Helicopter Links website. Do you want your advertising to be online so that anyone can view your advertising from any where in the world and at the time that the buyer wants to look at your advertising and on a year-long basis? We offer this! Do you think a year long advertising cycle will make it easier to analyze your advertising strategies on an annual basis? We think this is a good strategy. I hope this article helps you see the value of advertising on Helicopter Links. Please feel free to call me to discuss your advertising needs, our advertising options, prices options and how we can get your advertising online as quickly as possible. I'm available by phone at +1 (858) 413-7074 or email at staff@helicopterlinks.com.